Setting up childcare for your baby or toddler is a big decision. You want her to be safe, happy, and in an environment where she can thrive. An increasingly popular option is childcare programs, like daycare or infant and toddler care at preschools. Safety — Licensing requirements for childcare facilities include safety measures and inspections that ensure compliance. In comparison, in-home daycare (an individual who cares for a small group of children in their home) tends to be less regulated, and nannies and family-member care require no regulation. Consistent Care — Unlike nannies or other caregivers, childcare programs run on schedule even if a teacher is sick or on vacation. Less Expensive than a Nanny — While childcare programs are, on average, more expensive than in-home daycare or a family member who may care for your child for free, it can be half or even one-third the cost of hiring a nanny. Stimulation – Quality childcare programs for babies and toddlers offer plenty of varied stimulation through movement, meaningful interactions with adults, play materials, outdoor time, and both free-play and organized activities. Age-Appropriate Care – Quality childcare programs separate children and tailor their care, play materials, and activities based on age. An option like in-home daycare may not be able to do this. 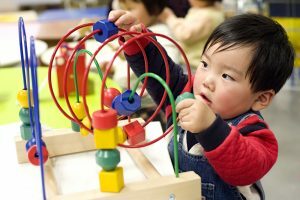 Skill Acquisition – Research shows that babies and toddlers who attend high-quality childcare programs have a slight edge over other children when it comes to language and cognitive skills. Social Support for the Family – Parents who send their children to childcare programs develop better social networks, which is linked to numerous benefits including better mental and physical health, and even stronger job prospects. Consistent Location – If you choose a preschool with infant and toddler programs, your child can stay in one place until she’s ready for kindergarten. This can make stages like separation anxiety easier to get through, and create a general sense of belonging and security for your little one. Illness – Especially for infants, who haven’t built up their immune systems yet, attending a childcare facility can result in easily catching colds and other contagious illnesses. If your child gets sick the facility will likely ask you to keep her home, which means you’ll need to take the day off or find alternate childcare until she is well. Less Individual Attention — Compared with nanny or family-member care, teachers at most childcare facilities care for at least three children at a time (often more). Waiting Lists — It’s common for quality childcare programs to be full and unable to guarantee your child a spot. Cost — While considerably less expensive than a nanny, childcare programs can cost a pretty penny. Prices vary depending on where you live, but the average cost of a full-time, quality childcare program for babies and toddlers in the U.S. is about $11,000 per year. Costs can also creep up if you’re late picking up your child, or if she is sick and you miss work or pay someone else to stay home with her. High Turnover – This is a common drawback of childcare programs, especially for infants, who rely on attachment to caregivers for optimal development. You may have noticed we said “quality program” a lot! If you decide to send your baby or toddler to a daycare or preschool, head over to this articleto find out what makes a childcare program a quality one.